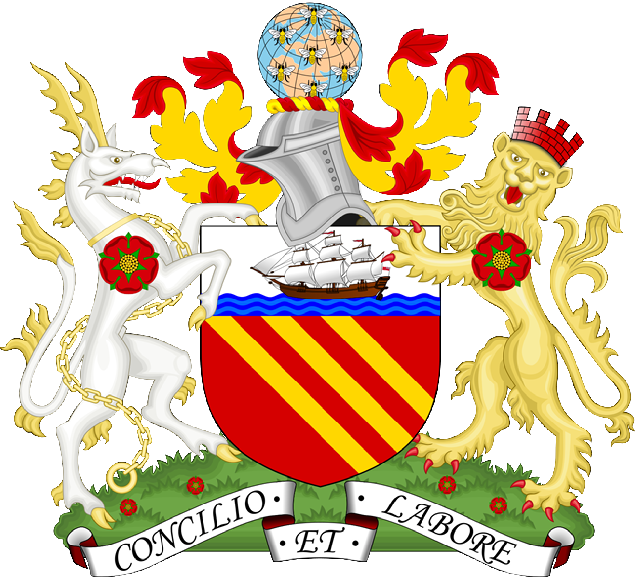 The Legal Genealogist has visited the City of Manchester, England, whose City Council’s coat of arms dates back to 1842. And so this morning — along with the rest of the world — I have no words. I have only tears… and anger… for the lives so senselessly cut short. There is nothing, absolutely nothing, that justifies attacks of this kind. Not on civilians. Particularly not on children. No politics, no alleged moral outrage, nothing. Judy, many thanks from the Eastern side of the Atlantic. It’s heartening to know that there are good people all over the world. And it’s just awful to know that there are a few, a very few, who would glory in what’s happened in Manchester and who would try to justify it. Inconceivable to me that anyone could “glory” in killing children. Just inconceivable. I too have been to Manchester and am also outraged at such cruel harm. There I was honored to visit the oldest free public reference library in the UK, Chetham’s Library, established in 1653. I hate to say this but we are in a war with no borders. The enemy wears no uniform, the color of your skin does not matter. Age is not factor, from babes to the very elderly, death can come quickly an unexpectedly. This enemy is driven by hatred and religious fanaticism. They wallow in their glory like swine in a mud hole, then hide in the shadows like the cowards they are.